Trump and cronies got cornered when information came out that recently appointed Attorney General, Jeff Sessions, met with a Russian Ambassador twice before the election. First it was Flynn. Now Sessions. Whose next? Sessions lied during his confirmation when he said he "did not have communications with the Russians." His lawyers are busy frantically parsing his words on record in an attempt to defend him. 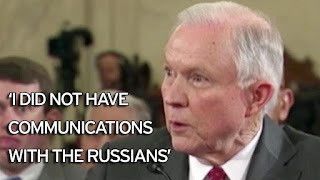 The White House quickly came out in Session's defence saying it was perfectly legal for Sessions to meet with the Russian Ambassador, and that he met with 25 other ambassadors too. One problem with that. No one else from Congress met with the Russians during the presidential campaign. The fact is there were accusations of collusion between Don the Con's campaign and the Russians that were being widely reported by the press. Sessions picked this period of time to secretly talk with one of Putin's stooges. At the time, then-Sen. Jeff Sessions, met with the Russian ambassador to the United States during the midst of last year's bitter election campaign, the Alabama senator was not only serving as a surrogate for candidate Donald Trump but had been named chairman of the campaign's National Security Advisory Committee. Go ahead and take a moment if you gagging. This whole affair stinks of corruption, greed, and treason. Thump's campaign got a lot of help from the Russians. That according to the 18 intelligence agencies who have concluded an investigation needs to be conducted to fully understand the extent of Russia's interference with our election, and Team Trump's constant contact with Russian officials during the elections. The proof is out there. Before President Obama left the White House he had the intelligence agencies save, and store, all of the information gathered by our government and intelligence from other countries like Britain, France, and Germany.